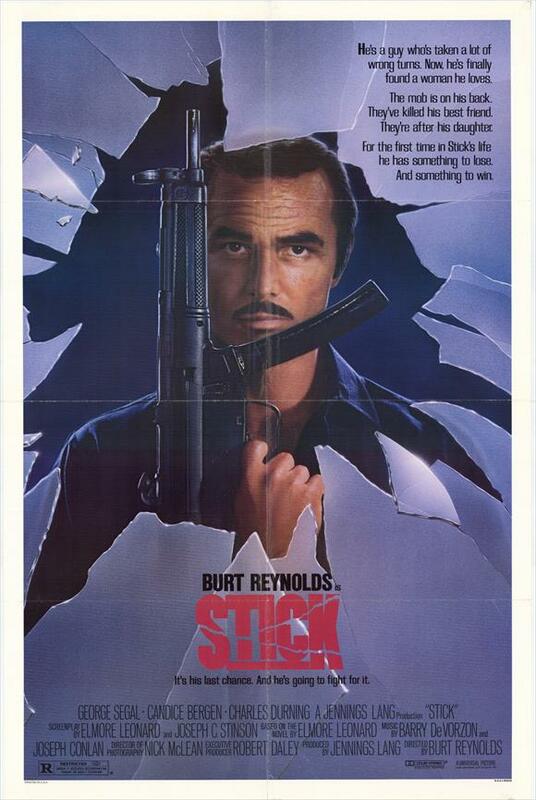 Burt Reynolds meets Elmore Leonard adds up to mixed results in this action oriented flick that saw Burt once again do double duty taking up the directing chores as well. 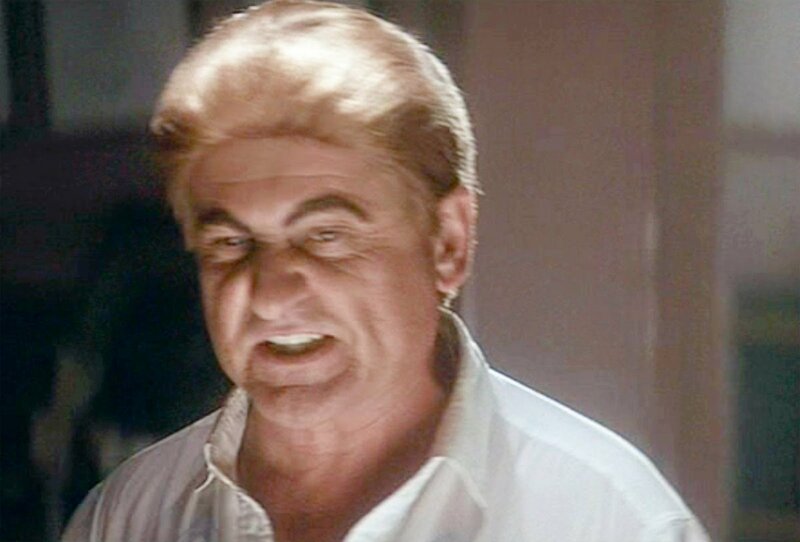 Not surprisingly he brought along pal and frequent co-star Charles Durning for the ride in what can only be described as the role Joe Pesci turned to for inspiration when donning his atrocious looking wig and eyebrows for his role in J.F.K. 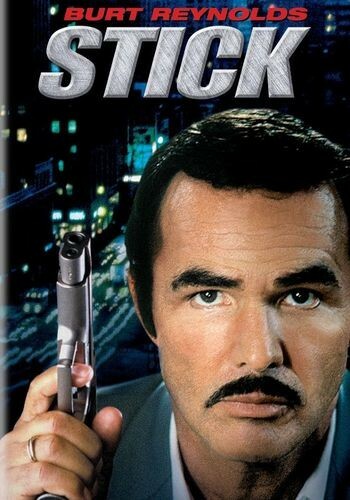 Burt is playing the title character “Stick” who has just got out of a 7 year stretch for armed robbery and finds himself tagging along with a pal to a drug deal gone bad in Miami. With his pal gunned down and Burt making enemies with Dar Robinson who plays his villainous looks to the hilt, the plot is set. 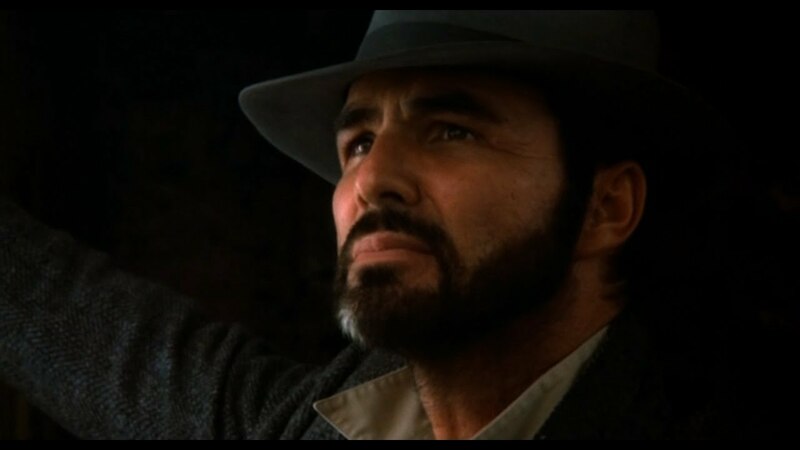 Burt’s stare down with Robinson might be the film’s highlight. Then again maybe Burt’s opening sequence at a bar where he KO’s a would be molester might squeeze into first place. Durning? He wants Burt dead and is feeling pressure from higher up the food chain to make it happen or he’ll find himself replaced. For good. Permanently. Do I have to spell this out any further? Burt’s on the run and attempting to lay low. Physically he’s getting in shape to go after Durning in a way that reminded me of “Parker.” The character played by Lee Marvin and Mel Gibson. He wants the money owed to him for the drop gone bad. Of course, he also wants his pound of flesh and he won’t have to wait long either. 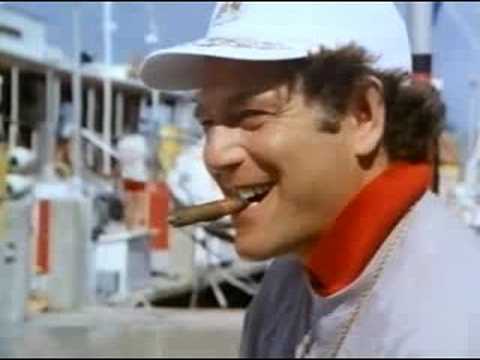 He targets Durning’s business associate played by a very goofy George Segal as a means to an end. Segal is a wealthy man about town who takes an instant liking to gangsters and tough guys. Burt fits the bill on both counts. 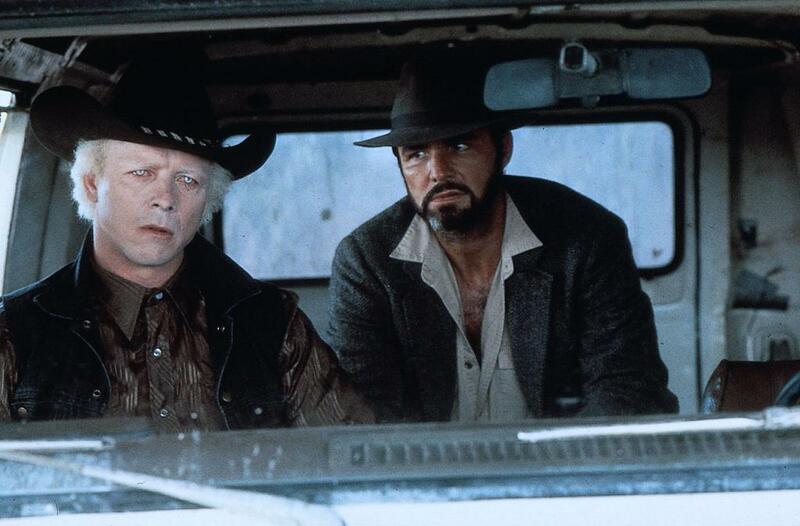 Burt hires on as a body guard/jack of all trades for Segal which puts him squarely opposite Durning and Robinson. 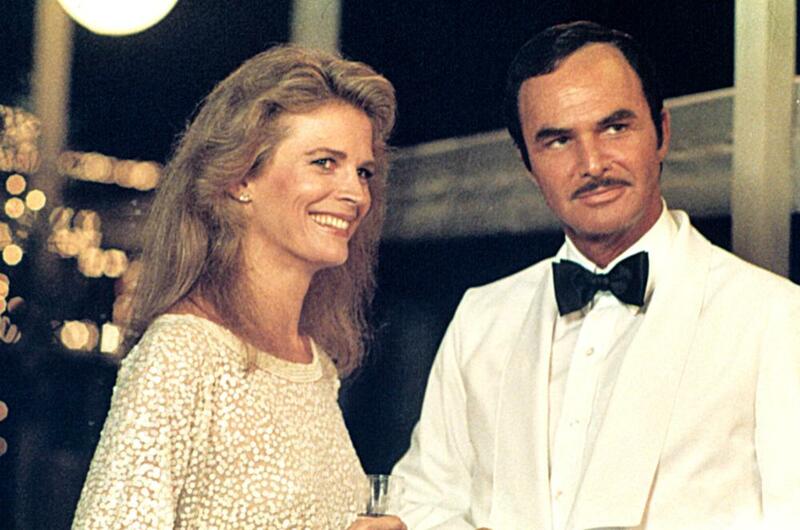 It also allows “The Burt” to meet the wealthy and attractive Candice Bergen, Segal’s legal advisor and more importantly, she’s single giving Burt a love interest as he dodges Robinson’s threatening presence. It’s a right hand turn that puts Burt right in front of Robinson for the film’s premier stunt that real life stuntman Robinson pulls off in spectacular fashion. It’s the real selling point of the film. Machine guns, fisticuffs and romance are sure to follow and one must assume a happy ever after existence for Burt and Candice with Anne Murray singing over the closing credits. This was a revisit a long time coming for yours truly. I saw this film at the theater when it came out and was unimpressed. I was turned off by Durning’s look and Segal’s clumsy millionaire when what I wanted was Sharkey’s Machine, Burt’s tough cop film from 1982. Yes I was probably a bit harsh on the film back then. Now it plays like a typical action film of the era with a bit of the Burt charisma thrown in for good measure. Sadly, Burt looks terrible at some points in the film. He’s underweight and it shows. Might this have been the film that began fueling all kinds of nasty rumors about Burt’s health? The timing seems right. Overall not a bad looking film with the location shoot and Burt has his moments that shine reminding us of just how big a star he was and how easily he could carry a film. Durning’s not the actor I would have cast here and his look backs me up I think. But he and Burt made many a film together and that’s good enough for me. If you get a chance to read Burt’s book, But Enough About Me, he pays honor to the late Durning with some kind words. As a matter of fact, grab it if you already haven’t. A good read where Burt recalls both his working relationships and friendships with many names you’ll recall. 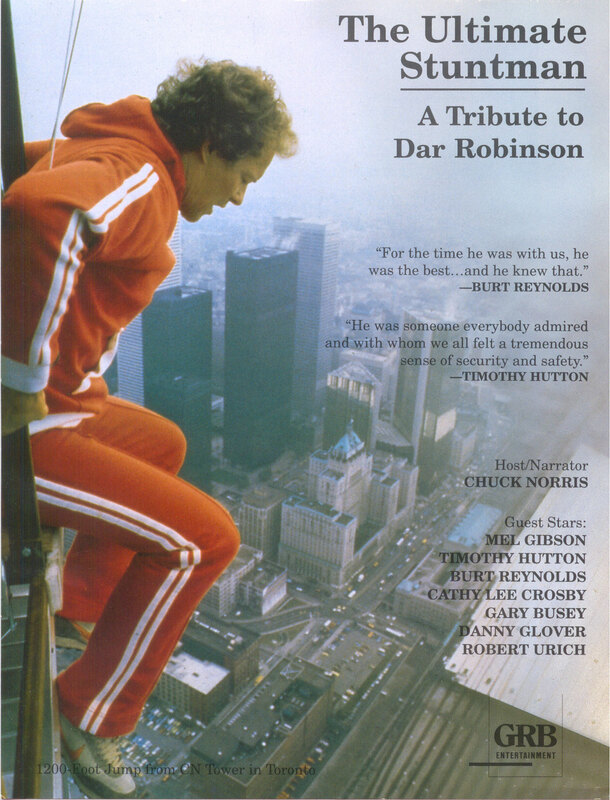 Dar Robinson was one of the best known stuntmen in the game at this time having worked on films from Rollerball to Nighthawks to Burt’s Sharkey Machine. However sad it might be, I find it ironic that he’d be killed in a motorcycle crash in 1986 at the age of 39. No I haven’t read the Elmore novel so I have no idea what liberties have been taken but I’m sure more than a few have which is pretty much standard with any film originating from an original source novel. In the end this one’s not all that bad and out of the blue it turned up on DVD from Universal just recently allowing me to get a second look at it after a lengthy hiatus. I think I first saw this one as a rental from my local video store, but I do remember not liking it all that much, and I can tell you exactly why: I’d read Elmore Leonard’s book first. Which was much, much better of course, but I always wonder why filmmakers take what’s good from a book and throw it away, and replace what’s good with their own ideas, which are worse. If you can, read the book and compare; Leonard writes some cool characters and cool dialogue, but nobody ever chooses to translate that to the screen (‘Get Shorty’ was probably the closest to getting it right I’ve seen so far). Although I just checked the poster, and saw that Elmore Leonard co-wrote it with someone, so maybe I have no idea what I’m talking about. He was listed as a co writer. Not uncommon to put in a treatment and then have it put on the next writers desk who movieizes it. If that’s a word. Of the book adaptations, I like 3:10 to Yuma (original), Majestyk, Jackie Brown and Get Shorty is my favorite Travolta character. Never read one of his books though keep saying I will one of these days. I remember seeing this as a kid on VHS shortly after it was released theatrically. I loved the stunt with ‘bunny-eyes’ falling off of the building. Wonder if John McTiernan was influenced by this scene when he filmed the infamous shot of Has Gruber falling off of Nakatomi Plaza three years later. I read the book too but don’t remember much about it. Nice comparison to the Die Hard scene. In Stick it’s the highlight of the film and I remember that was one of the marketing campaigns on it. Oh, I paid to see this in a theater, so I lose (lol). 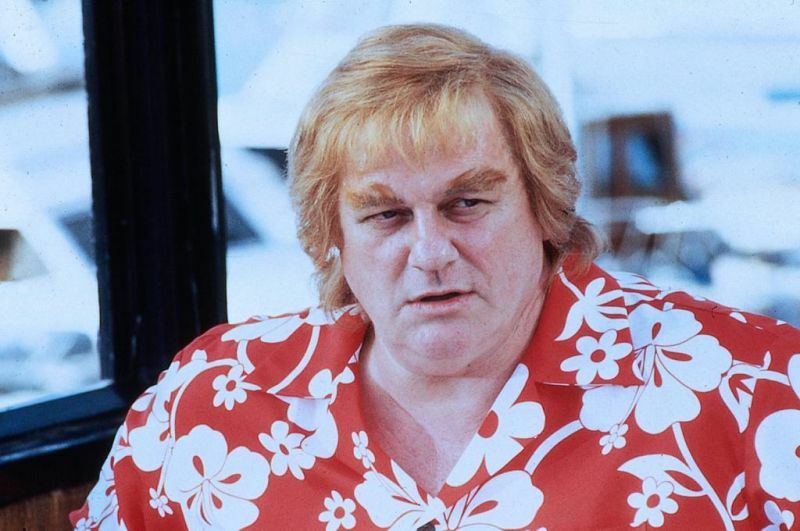 It was a weird film partly because of all the toupee and wig action that was crazier than all the stunts, heh. lol. Yes the wigmaker was probably the highest on set expense. Great stunts and of course the “fall” was magnificent by Robinson. Yeah “the Burt” was about to fall from grace with an endless stream of bombs and poor choices. I gagged when Cop and a Half turned up.